The Integrated Reasoning section of the GMAT launched in June 2012 with 4 new question-types, all of which require some solid data analysis skills. Learn how to get an above-average score (a 5+ on the 1-8 scale). The Integrated Reasoning section was designed to measure test takers’ ability to interpret data from a variety of sources, and to draw meaningful conclusions from this information. It launched in June 2012– so what are the four question types, and what’s the general format? Check out this Learnboard for all the basics first! Start by reviewing Graphics Interpretation problems with an expert! In this video lesson Brian Galvin, Director of Academic Programs at Veritas Prep, provides a deep-dive lesson on Graphics Interpretation, reviewing multiple questions. The Graphics Interpretation section will present you with a piece of data in the form of a graph, Venn diagram, scatter plot, etc. Below will be two statements, each with a missing portion. Fill in the blank with one of four choices presented to you in a drop-down menu. Check out more tips on improving your skills on Learnist! It’s possible to get a great GMAT score after only 1 month of study, but it requires hard work and discipline. In the middle of applying for scholarships and filling out MBA applications, you’ll need to devote a good amount of time to your GMAT practice as you’ll be cramming what is typically a 2-3 month process into just one! There are excellent GMAT resources online: from free GMAT practice tests to great Test Prep articles. Follow these GMAT study tips to maximize the free GMAT resources for better scores in just one month! 2. Study every day, and don’t procrastinate! You will need to be disciplined about your studies. Work backwards from your test date. Don’t cram on the weekends only! With only one month to study, you’ll need to do at least some GMAT every single day. 3. Use MGMAT SC & Powerscore CR to supplement your materials. After the OG, these are two Verbal books that can take your score to the next level. 4. 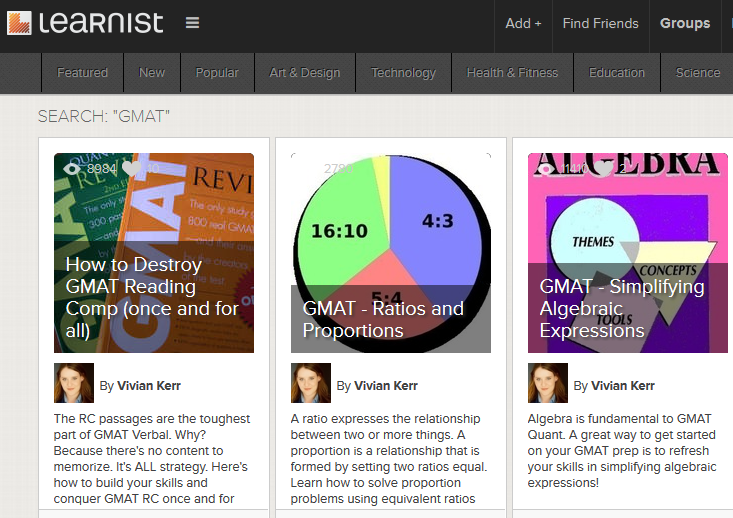 Join Grockit, and Beat the GMAT. These online GMAT sites are vital to building your comfort level with the computer-based format of the GMAT. Practicing in the test-format will only increase your chances of doing well! 5. Study in short, intensive blocks. GMAT study blocks that are too long will ultimately wear you down. Make sure to rotate your study topics often and abide by it, even if you’d like to squeeze in a few more hours. Staying up all night to complete yet another practice test is not always the best choice. 6. Track down success stories to get inspired. 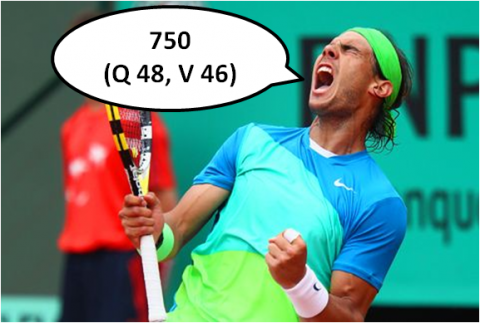 If you have a 600 and are eyeing a 700+ score, there are many people out there who have made that leap. Success leaves footprints. Find out what strategies are commonly used by 750+ students, what study plans they keep, and how they build their content-knowledge. Beat the GMAT is an excellent tool for this! 8. Review all questions. Use the 40/60 rule. 40% of your time should be spent actually answering questions. At minimum, 60% of your time should be spent reviewing. 9. Take at least 1 GMAT practice test per week. Don’t take your practice tests sitting cross-legged on you bed. Utilize your desk and scratch pad as you would on the actual test. Your body needs to adjust to what it feels like to take a 3+ hour test. Because you only have one month to prepare, you should plan to take 4 practice tests, although 6 would be ideal. 10. Use a strategy for each question type. Not only do you have to choose a strategy that works for you, but you have to implement it every time, practicing enough so that is becomes second-hand. Ballet dancers practice a pirouette millions of times, so that when they perform onstage they don’t have to think about it. You want to do the same thing for GMAT. The Integrated Reasoning section was designed to measure test takers’ ability to interpret data from a variety of sources, and to draw meaningful conclusions from this information. It launched in June 2012! To answer IR questions, first understand what the question is asking, then stop and consider which table, graph, chart, or part of the passage provides the relevant information you’ll need to solve for the correct answer. Harder IR questions will require you to use more than one screen or ask you to take information or figures from one screen and apply it to another. Pay attention to the trends in the presented information. Integrated Reasoning scores will range from 1-8, in single-digit intervals, and will not alter the existing Quantitative, Verbal, Total, and Analytic Writing Assessment scores. To get more fact about how to approach IR, check out this Learnboard!